Bloodstock 2019 adds another 5 bands! Ross November 20, 2018 Tours/Live Dates No Comments on Bloodstock 2019 adds another 5 bands! Bloodstock is excited to announce another five more bands for August 2019’s heavy metal weekender. Dear Bloodstockers! The Magus returns to the UK to lay waste to your eardrums with metal! We are honoured to be headlining the Sophie Lancaster stage and we will put our hearts and souls into making it something special for all of you. Can’t wait to see you all! The band have been hard at work in the studio on the follow up to 2016’s Sword Songs. Check out a sneak peek from the studio with JB here. We haven’t played Bloodstock since 2013, when we had to run straight from the stage after a blistering set to a van that took us to the airport to make it to our next show! So we look forward to experiencing this incredible festival properly in all its glory in 2019! It will have been six years since we graced that stage and we have been dying to return. We promise to show you how eager we’ve been to get back to Bloodstock with a pure thrash set fuelled by raw human aggression and passion! Thank you Bloodstock for bringing us back! The band have also been working on new material for their ninth studio album set for release in 2019 with producer, Jason Suecof. In the meantime, check out ‘”Lost” from 2016’s The Evil Divide album here. We can’t wait to get over to the UK and bring Damned If You Do to our fans overseas. Bloodstock is going to be an incredible time and a show not to be missed. Noted for founding both punk group The Dictators and the legendary Manowar, Ross Friedman and his band Ross the Boss join the bill. Having been introduced to Manowar co-founder Joey DeMaio by none other than Ronnie James Dio, it seems only fitting that Ross the Boss will perform on the Ronnie James Dio main stage on Sunday. Check out the video for the title track of current studio album, By Blood Sworn here. Last but not least, a Catton Park favourite, Evil Scarecrow will bring their intergalactic party to the main stage on Saturday. The band have an array of fabulous vinyl and special editions available for recently released studio album, Chapter IV: Antartartica over at PledgeMusic. While you peruse the goods on offer, check out new track, “Red Riding Hood”, about a martian invasion (naturally) over on their YouTube. 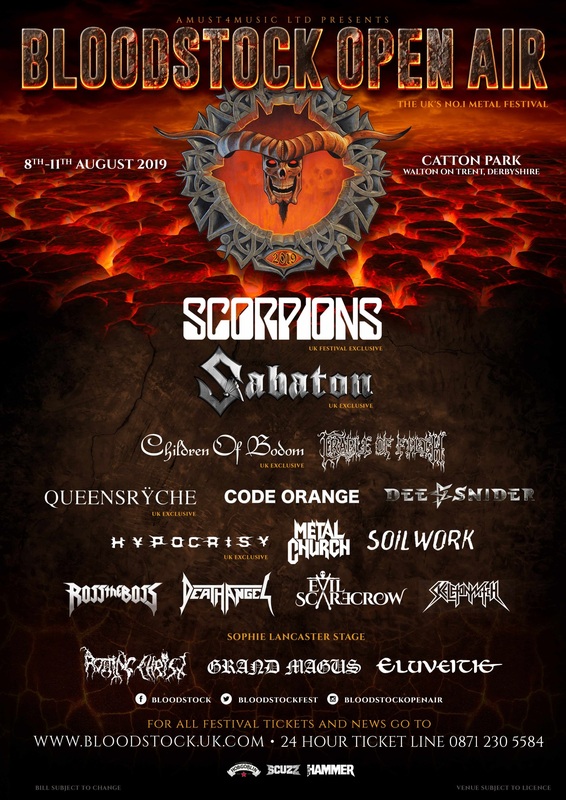 These five join the previously announced Friday night headliner, Sabaton, Sunday’s bill toppers Scorpions, together with Children of Bodom, Code Orange, Soilwork, Cradle of Filth, Skeletonwitch, Dee Snider, Queensryche, Eluvitie, Rotting Christ and Hypocrisy on the Catton Park stages next August. Stay tuned for more bands to be announced soon! Standard weekend tickets are still currently available at ‘early bird’ prices (just £132 for four days of metal fun), so pick up yours at the ticket store – if you want to save a few quid. Camper van passes are also available in limited quantities, but be quick, as limited spaces remain. Bloodstock’s first wave of 2019 Serpents Lair VIP tickets are now sold out! A second wave, including deluxe VIP packages (Luxpads, Bellepads, Podpads, etc) and a limited amount of VIP upgrades (for those who’ve already purchased standard weekend tickets) will become available on Monday 17th December at 9am. For full details click here. You can also subscribe to the Bloodstock e-mailout to get band and news announcements as they happen!